Copy is a relatively new cloud storage provider which is similar to Dropbox. It is much generous with the free space. From the friend referral program, I have earned 1 TB free space which is unbelievable. 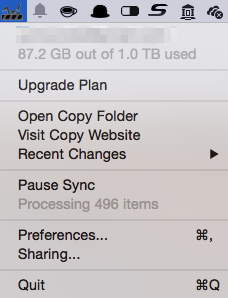 Since my Mac's SSD has only 256 GB, I set the sync folder of Copy to an 1 TB external hard disk and was quite happy at the beginning. But soon the problems occurred, the uploading speed of Copy is much slower compared with Dropbox, and what makes things intolerable is that the Copy app keeps checking every single synced file every time I power on my Mac, despite there is NO change at all. I am not exactly sure whether this is an issue related with the location of the sync folder or not. I have roughly 80 GB music and other stuffs synced by Copy. After start the Mac, the spinning noise of the external hard disk can last hours or even whole night, which makes me finally decide to stick with Dropbox. So from my personal experience, I think Copy is not well polished and optimized. Dropbox, if you don't mind the price tag, Dropbox is the best choice at this moment. The newly announced iCloud 50 GB/ $0.99 plan seems very reasonable. Hope Dropbox may launch similar intermediate plan in the future.